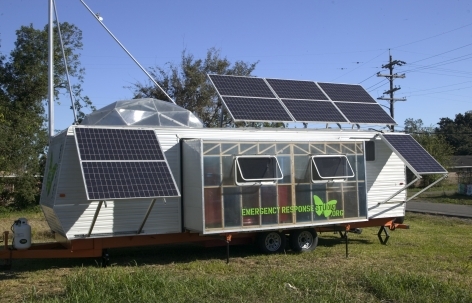 Emergency Response Studio, by Paul Villinski, is a solar-powered, mobile artist's studio, repurposed from a salvaged FEMA-style trailer. 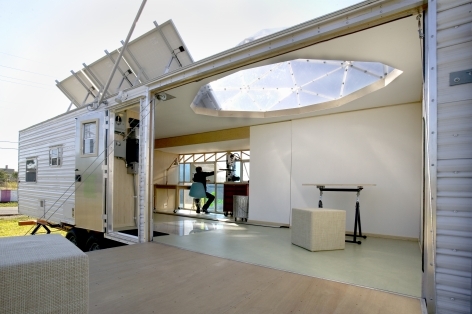 This sustainably re-built, off the grid living and workspace is designed to enable artists to "embed" in post-disaster settings, and respond and contribute creatively. 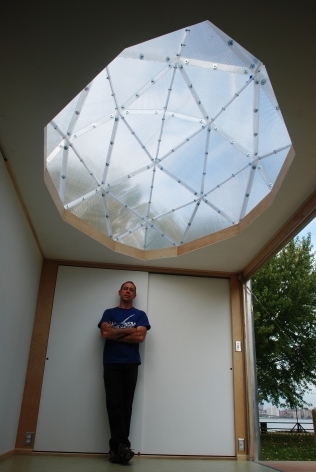 Villinski conceived the project in response to the devastation of post-Katrina New Orleans as "a symbol of transformation and possibility for the communities of the Gulf Coast." ERS will be exhibited in Prospect .1 New Orleans, the largest exhibition of international contemporary art ever organized in the United States, which opens throughout the Crescent City November first, 2008. 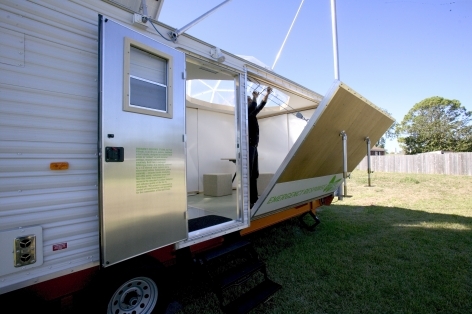 The project playfully and purposefully deconstructs the template of the now iconic FEMA trailer. Villinski gutted a 30-foot Gulfstream “Cavalier”, removing materials known to off-gas formaldehyde, and rebuilt it with "clean tech" solutions. 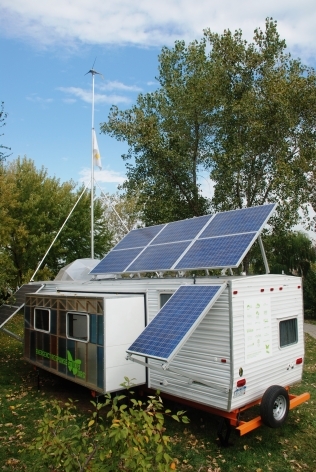 The studio is entirely powered by a 1.6-kilowatt photovoltaic solar system featuring an array of nine large solar panels, which tilt upward from the trailer’s roof to face the sun. 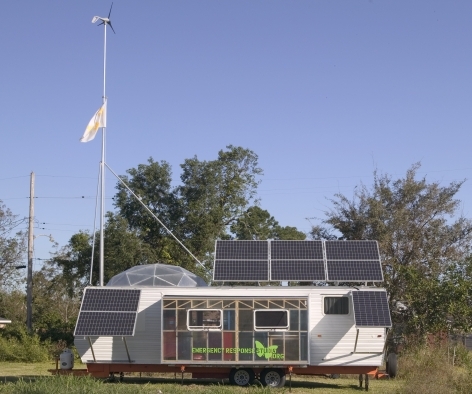 Additional power comes from a micro-wind turbine spinning atop a 40-foot high aluminum mast. Eight large batteries, each weighing as much as an average man, store this power and are seen underfoot through a clear Lucite floor section as one steps into the trailer. 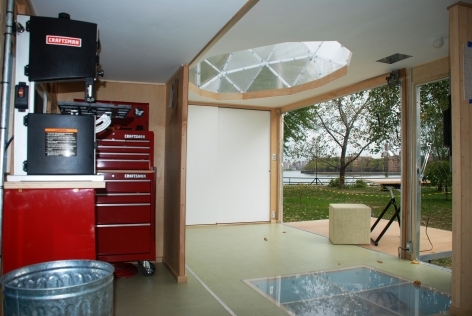 A large wall section cranks down to become a deck, a ten-foot, geodesic skylight provides daylight and expansive headroom in the work area, and a thirteen-foot wall section has shed its aluminum siding in favor of clear polycarbonate sheathing. Symbolically, the structure is expansive, both opening outwardly and inviting the outside in, enabling free exchange between artist and environment in a collaboration of reinvention. ERS has been reconstructed with sustainable, green materials -- recycled denim insulation, zero-VOC paints, bamboo cabinetry, compact fluorescent lighting, reclaimed wood and floor tiles made from linseed oil -- minimizing the structure's carbon footprint and enhancing quality of life for its inhabitants. 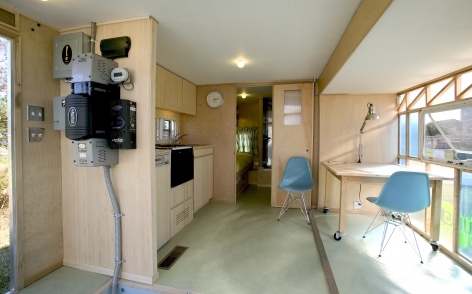 Though designed as an artist's studio, the Emergency Response Studio also serves as a prototype for self-sufficient, solar-powered mobile housing, and explores the application of sustainable materials in the construction of trailers and other forms of temporary housing. 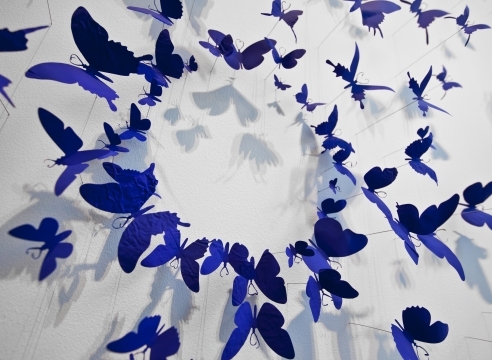 Villinski, who creates art out of discarded objects and repurposes them into provocative sculptural pieces of beauty and transformation, conceived the project in 2006 while in New Orleans preparing for an exhibit at Jonathan Ferrara Gallery. Moved to create artwork in direct response to the conditions of post-Katrina New Orleans, he wished he could bring his New York studio with him to the Lower Ninth Ward. With the Emergency Response Studio, the artist suggests that inventive, non-traditional thinking practiced by visual artists can be a valuable part of the mix as we attempt to heal what is damaged and confront imminent challenges of all sorts. A graduate of New York’s Cooper Union for the Advancement of Science and Art, Villinski's work has been featured in numerous exhibitions and is found in major collections, including recent acquisitions by the Museum of Arts and Design in New York and the New Orleans Museum of Art. Villinski is represented by Jonathan Ferrara Gallery in New Orleans and Morgan Lehman Gallery in New York. Villinski's vision for ERS was realized through vital funding and in-kind donations from generous supporters, including: Advanced Solar Power, Blauen, The Peter and Carmen Lucia Buck Foundation, Build it Green! NYC, Evergreen Solar, Jonathan Ferrara Gallery, Forbo Flooring Systems, Global Green USA, Green Depot, Greenhouse Capital Partners, GRK Fasteners, groSolar, Cristina Hadzi Interiors, Adam Lewis, Robert Mason with Anthony Dalo Woodworking, Morgan Lehman Gallery, Outback Power Systems, Smith and Fong Plyboo, Socrates Sculpture Park, and Gregg Wagner, RA. 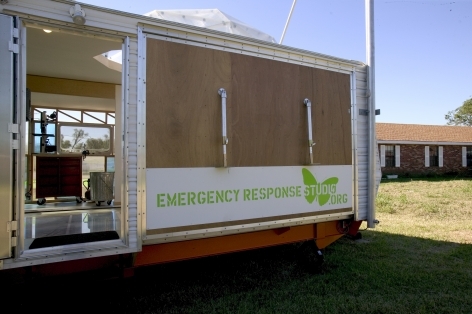 Emergency Response Studio will be exhibited from November 1 – January 18th across New Orleans at sites including the Global Green Visitor Center in the Lower Ninth Ward, The New Orleans Museum of Art, The Charles Colton School, and downtown New Orleans. 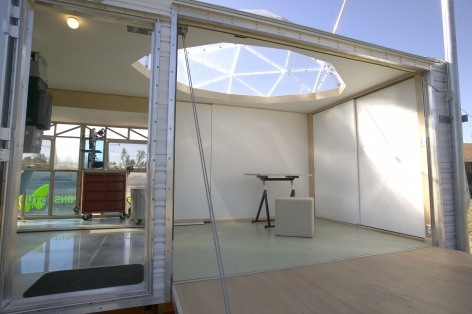 The studio arrives in New Orleans’ Lower Ninth Ward on October 25th. For more information, please contact Jonathan Ferrara Gallery at 504-522-5471 or info@jonathanferraragallery.com, or visit the project website at www.emergencyresponsestudio.org.